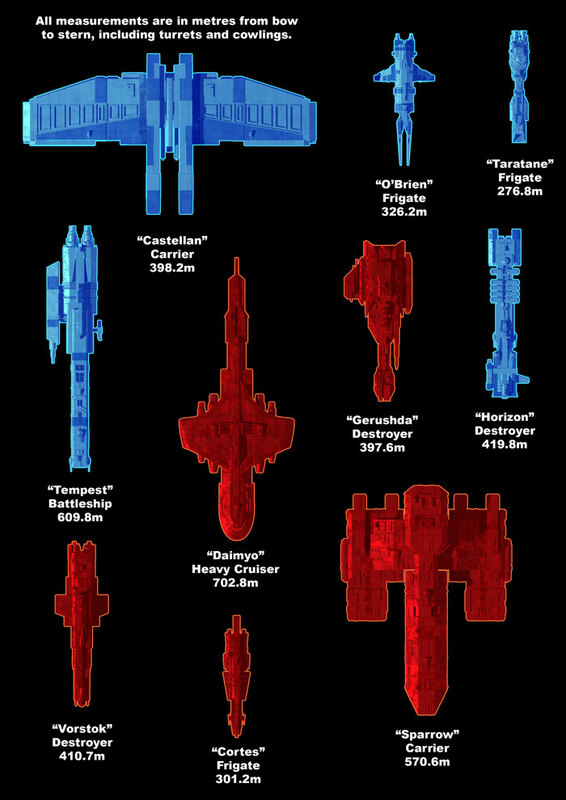 An overview of the capital ship classes which fought at White-Rim, all to scale. As usual, red = Alliance, Blue - Republic. Some ships aren't done justice by the top-down view, such as the Tempest, Castellan and Vorstok classes, as they have significant vertical elements in their design. All of my ships are built to scale with each other, making it easy to place them in scenes together - they are essentially my "miniatures". The Scimitar however has two models, the miniature for wide-shots, and a larger model which is scaled to my characters for close-ups. Tomorrow we'll take a look at the fighters. Chapter 3 will begin on Monday. For Friday's filler, I want to do a more detailed examination of one of the ships from White-Rim, with stats and multiple views, and you get to choose which ship you want to see. I've set up a poll in the forum where you can make your voice heard.